Suitable for riders and non-riders. Above are just some of our most popular examples, but we can also tailor make and do any length of stay with any number of lessons, . 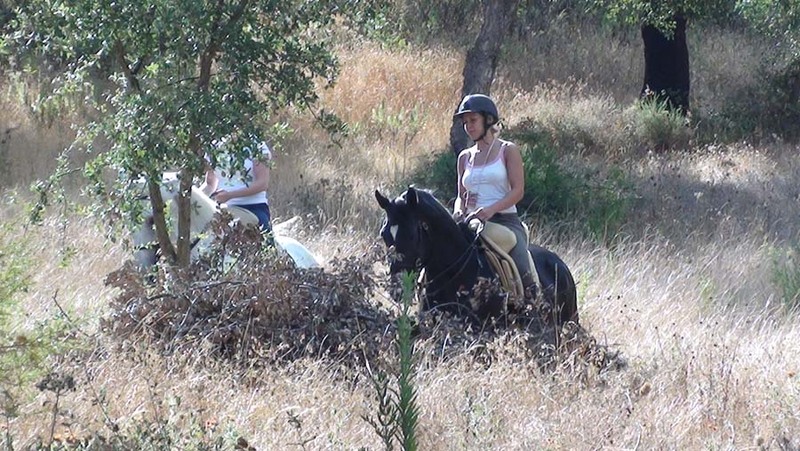 There are also some lovely trail rides in the surrounding countryside and you can exchange a lesson for a ride instead, giving you an opportunity to take your beautiful Lusitano stallion out for an hour to chill and relax. 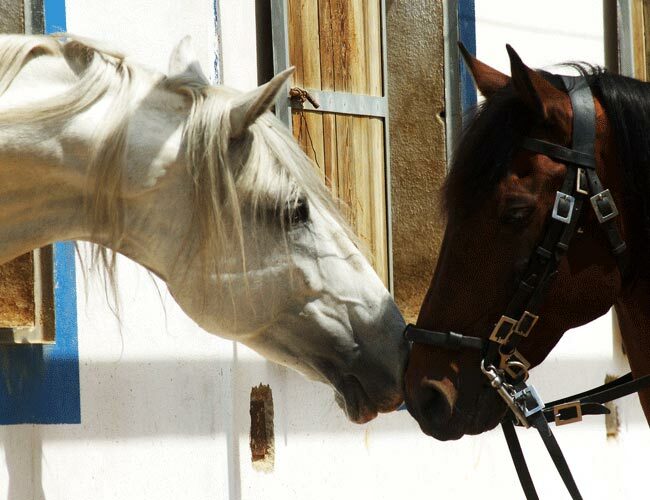 Each year in November in the small town of Golega, the most magical celebration of the Lusitano Horse takes place. 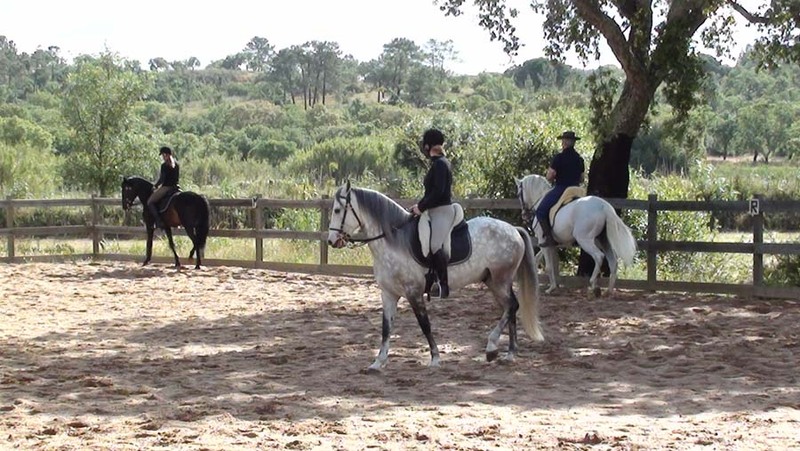 Riders, breeders, buyers and locals from all over Portugal and beyond, gather in the town to showcase their animals, watch and socialise, it has a unique carnival atmosphere which is to be experienced if you have a special interest in the Lusitano breed. We can easily add this into your package and include some days riding either side. 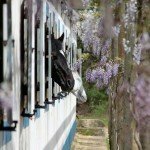 Included – All your riding, full board accommodation, soft drinks with all meals and wine with lunch and dinner. Excluded – Flights, transfers, alcohol outside mealtimes & tips. International flights to Lisbon airport. You can hire a car or we can arrange to pick you up at Lisbon airport, £100 per car return. It’s a 45 minute transfer. 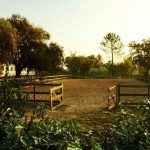 Quinta do Archino is a working, rustic Country Farm in Portugal, just 45 minutes from Lisbon, offering clients some of the best one on one Classical Dressage Training in Europe. 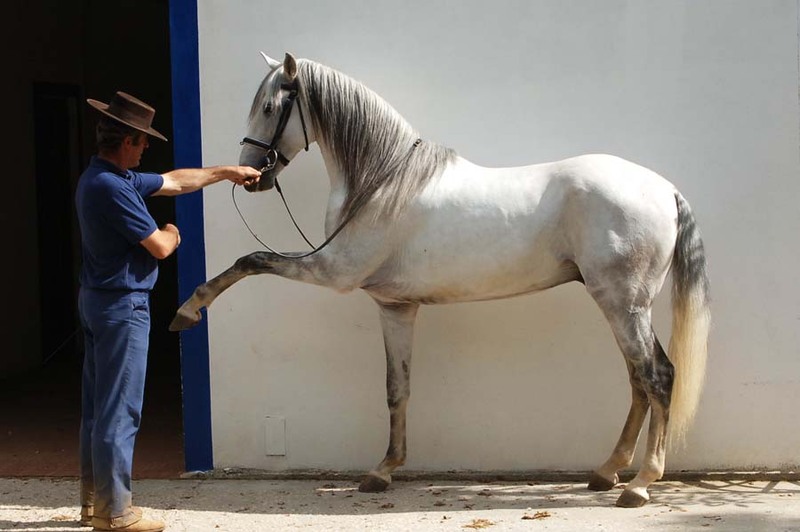 Your host and owner Francisco de Bragança has been breeding and training Lusitano horses for over 30 years. 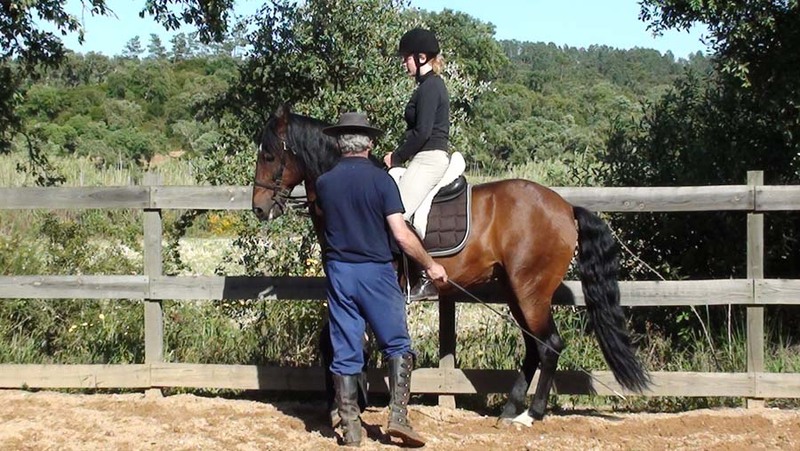 He trained with Mestres Nuno Oliveira and David Ribeiro Telles and is passionate about conserving classical principles for the benefit of all horses and riders. 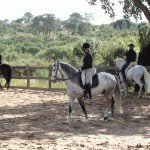 Quinta do Archino takes small numbers of Classical Dressage, a maximum of six clients at any one time so that individual attention is assured; all the riding lessons are one to one. You are encouraged to watch fellow guests from the gallery while they ride too, to learn as much as possible during your stay. 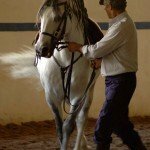 In addition to the riding to improve your Classical Dressage skills and knowledge, there is also Work-in-Hand and Lunge lessons which are taken either in the indoor arena or outdoor. 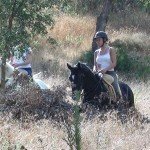 There’s also the opportunity to ride your well tuned Lusitano mounts out on trails in the beautiful surrounding countryside. There are no cars or gates to open and perfect footing all year round. It’s often a chance to take a break from the intensive training taken in the arenas. 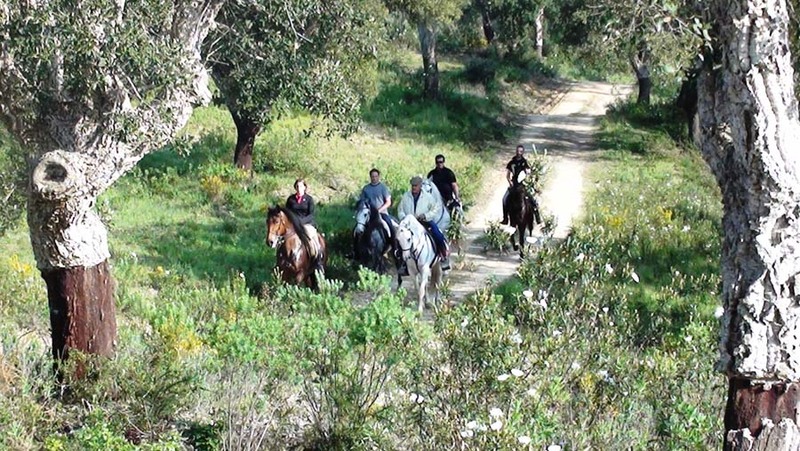 Ride undulating hills and climb up amid the scent of Pine and Eucalyptus to take in bucolic views. The area features sprawling grassy plains and gentle streams to cross. 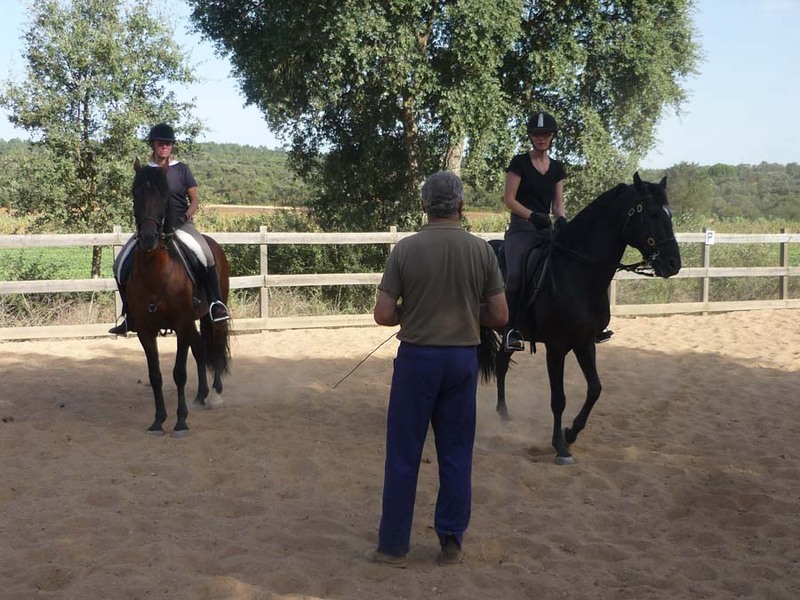 This is most definitely the place to visit if you are a Classical Dressage enthusiast, prior knowledge of this way of teaching is an advantage if you want to gain the most from this holiday. 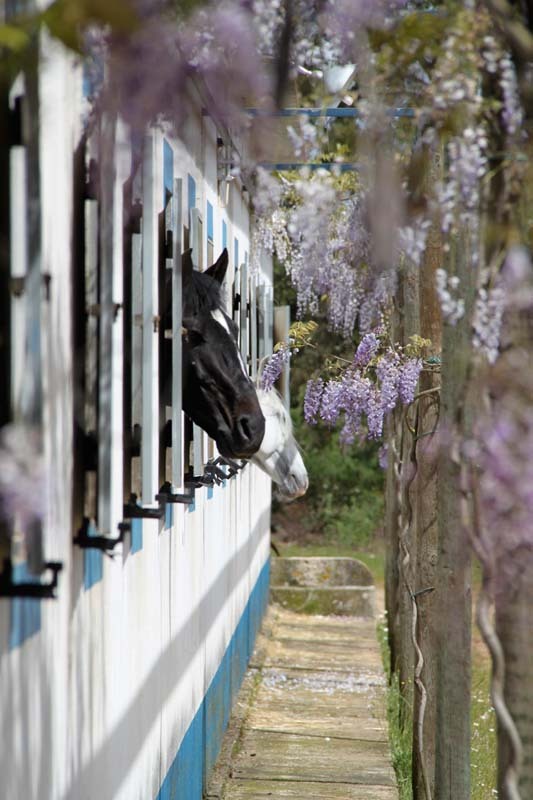 It’s also a lovely place to take a non riding partner especially in the summer months, when they can relax by the pool, watch some of your training or disappear on day trips to fishing villages, the beach or nearby towns. 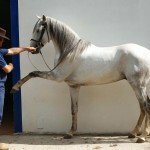 Classical Dressage Horses – Mostly schoolmaster Lusitano stallions. 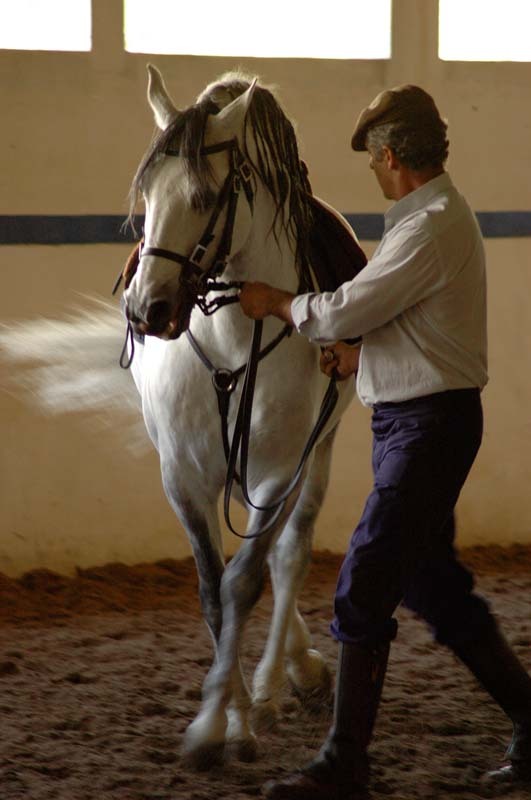 All are trained in the lateral movements, and the more advanced horses offer piaffe and passage. 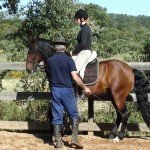 They will be groomed and tacked up by a member of staff allowing you to relax and focus entirely on your lesson. 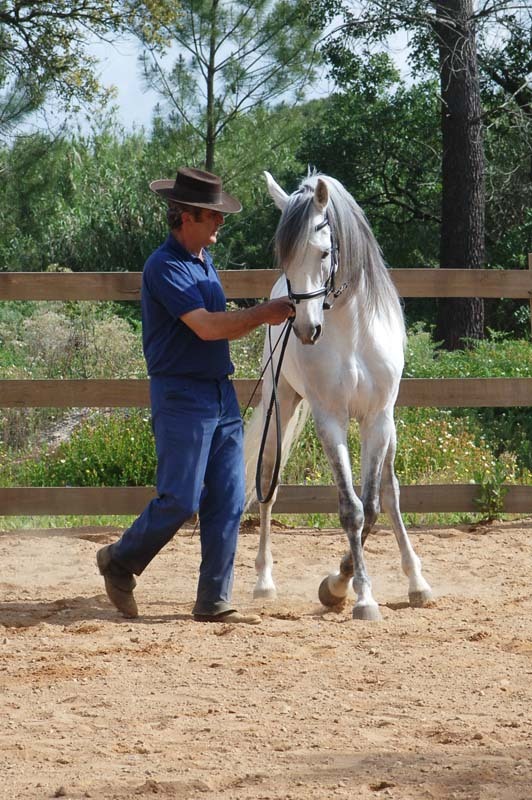 Francisco also has his mares, which he’ll gladly take you to meet and talk to you about his breeding programme. 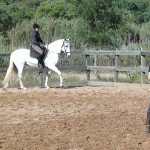 Classical Dressage Level of Riding & Pace – Intermediate to advanced. 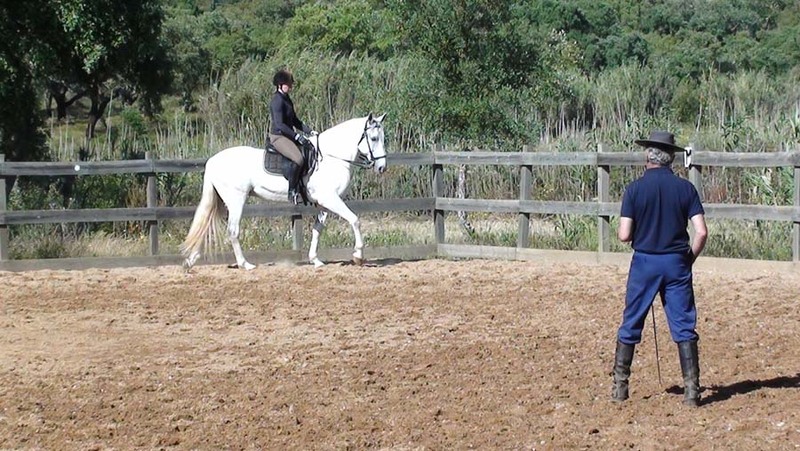 It is a huge advantage if you have a prior knowledge of the Classical Dressage training methods. 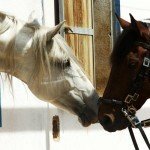 Tack – Mostly double bridles & dressage saddles. 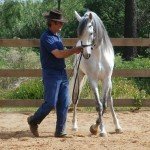 Classical Dressage Weight Restriction – 95kg / 210lbs / 15 stone. Classical Dressage Group Size – Maximum 6. 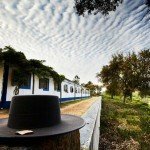 You will stay at the family home which is a very pretty, traditional farmhouse in comfortable twin room accommodation, looked after by Francisco’s warm and very friendly wife, Maria. There is a communal dining room, lounge with wireless access and a cable TV, plenty of outdoor space to relax and a lovely swimming pool to take a dip in the heat of the day. The food is delicious, well thought out and in the most part, Portuguese style. Breakfast – A heary light breakfast, tea, coffee, orange juice, cereals, yoghurts, three types of bread, ham, cheese, fresh fruit & a selection of hot dishes, usually eggs and bacon. Lunch – A proper lunch, but lighter than dinner. Some fish or meat with potatoes or pasta, lots of fresh vegetables from their own garden and fruit. Dinner – Always 3 courses, home made soup followed by meat and potatoes or a pasta dish, again with lots of fresh vegetables. Desert is a cake or ice cream, always homemade. Snacks – If you are hungry in the late afternoon, you are welcome to ask for something and usually you will be served some Portuguese bread and cheese. 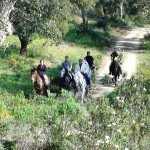 Horse Riding Holidays like our Classical Dressage holiday are part of the Zara’s Planet collection of Horse Riding Holidays Portugal. There are lots of sight seeing choices and here are a few suggestions within an hour of the farmhouse. 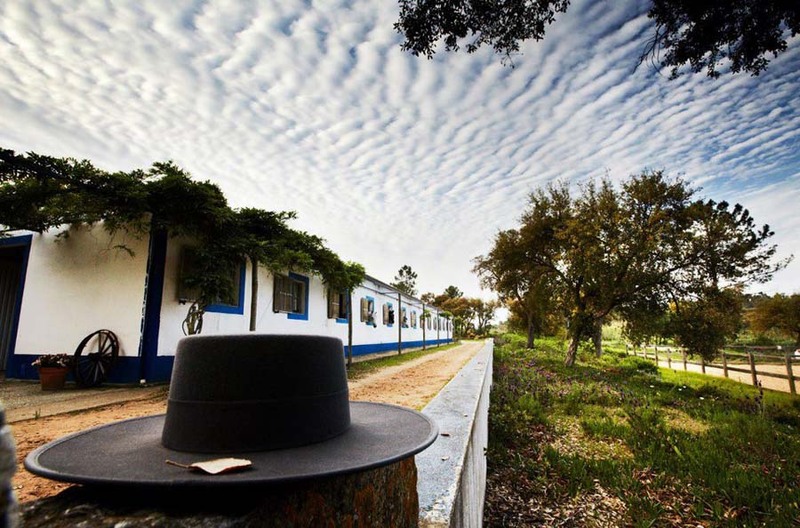 Obidos – A centuries old well-preserved medieval town with castle, cobbled streets and annual festivals. Nazaré – A traditional fishing town with a spectacular view of the beach. Lisbon – The capital city on the banks of the river Tejo, plenty to do and see here day or night. Golegã – A small, picturesque town, probably most famous for the annual horse fair in early November. Another great way to explore the area, is to hire some bikes, about 25Euros per day, which gives you the option to explore the nearby villages and have a drink and a shop. There is a maximum of 6 riding guests to stay at any one time so that individual attention is guaranteed; all the lessons are one to one. You are welcome to watch and film from the gallery to learn as much as possible during your stay. You can choose from Classical Dressage, Work-in-Hand or Lunge lessons in any combination you wish, taken indoors or outdoors. 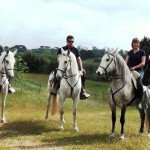 The usual 7 night riding holiday is available most weeks of the year and shorter and longer breaks are available on request. Arrive early evening, about 6pm in time to settle in and be ready for dinner at 8pm. 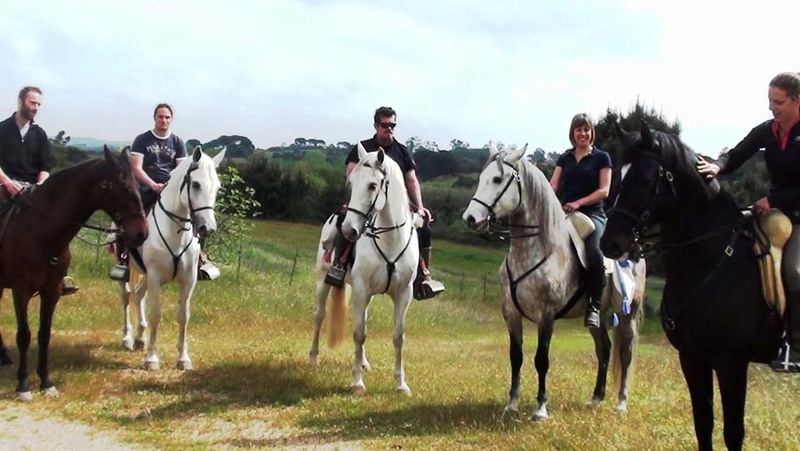 Ride twice a day, mornings and afternoons, lessons and riding out over the estate. One last morning lesson before departing for an afternoon flight home. We had a great time and learned lots. Yes we will definitely return and train with Francisco! He was inspirational. As were his wonderful stallions!